It’s also feeding time for vegetables in full growth with a fertiliser or liquid manure. Salad crops you sowed early should be ready to lift, along with early potatoes and autumn-sown peas and if you didn’t sow your own leeks and brassicas you should still be able to buy young plants from the garden centre or nursery. Continue succession sowing for a continuous supply of salad crops and root vegetables such as carrot, swede, turnip and beetroot. Towards the end of the month sow endive and chicory for winter salads and stop picking asparagus and rhubarb to give the plants time to develop ready for next year. 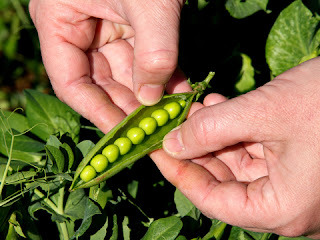 Pick peas when they produce mature pods.